Advice and professional help for fox problems. Fox are mostly harmless, but sometimes it's necessary to remove foxes from an urban or rural area because the animal is causing real problems. Some people just have a fear of foxes, as if they're dangerous predators, but they're not. The truth is that foxes will pretty much never attack pets, and never people. Still, they can cause some problems. They do prey on people's chicken coops, for example. Foxes have become common urban or suburb animals in many areas, and can dig through garbage, eat pet food, dig in the yard, and potentially live under a house or shed or porch, and spread fleas. It's not unusual for fox to set up a den underneath a porch. Need fox removal in your hometown? Click here for my nationwide list of hundreds of wildlife removal experts, serving all 50 states! Updated year 2018. Why would anyone want to get rid of such adorable little animals? However, the truth is those adorable faces are just a disguise for what they really are; sneaky predators who’ll feed on your farm animals or dig through your garbage. In fact, they will even destroy your property without a problem. They feed on turkeys, chickens, geese, lambs, baby pigs and more. Oh, and they won’t feel bad about it. Foxes can cause so many problems for a homeowner that they’ll find themselves getting ready to sell their dream home in an attempt to save their animals and property. The best way to protect your land is by getting rid of them completely. While some of us just can’t help feeding those sad faced stray dogs and cats that tend to linger around the house, this good deed will actually draw in another stray such as the fox. Some foxes eat pet food and once they know that you’re supplying it to the neighborhood animals for free, they’ll certainly be by more often to get their share - and everyone else’s. Protect your livestock by using a wire fence to keep foxes from getting to them. Position the wire below the ground; at least 10 inches. The wire surrounding your livestock and poultry should be about 6 inches high. You can also use an electric fence. If the fox gets closer than he needs to, he will get a shock that he definitely will not be happy about. However, keep in mind that other animals (and humans) may also get a shock they won’t be too happy about either. Electrical fences really shouldn’t be used to deter foxes. Fox repellant can also be a good temporary solution. The repellant delivers an offensive smell to foxes that discourage them from coming around the area. When purchasing repellants, it is best to obtain them from garden stores so that you know they are approved for repelling foxes. Although they may have strong chemicals in them that drive foxes away, it is not harmful to other animals. In fact, it won’t even bother your garden, plants or flowers. It is perfectly safe to use. However, some foxes often become immune to the scent and eventually return. The fox traps used today are pretty simple when it comes to design and usability. Be cautious of the traps that you buy because some of them contain grease or oils that ooze a strong scent which may persuade the fox not to come near it. Foxes often return to spots where they have previously been or close to their normal travel and hunting routes. This is where you should set up the trap. Take two coil traps and place them apart by 36 inches. Between the two coil stakes that you have set up should be a stake in the ground. This stake will secure the trap, but you must make sure that it is sturdy in the ground. You’ve gotten your trap set up and you’re ready to catch a fox. The only thing to do now is disguise the trap. Foxes are pretty smart creatures and they’re not just going to willingly walk into a trap for you – you’ve heard the saying ‘as cunning as a fox’. You can disguise your traps by using hay. Place hay all over the trap area so that there would be no reason for the fox to be suspicious. Not much hay is needed; just enough to cover the metals of the trap and the opening. Everything is set and all you have to do is check the trapping spot every day. However, it’s important that you check from a distance so that you don’t get a scent in the area. If a fox picks up a scent from a human on their normal route, they’ll switch up routes quickly. The main thing to do to get rid of a fox is to eliminate their source of food in the area. When a fox visits a place a few times that never seems to have a supply of food, they normally don’t make their way back there anymore. To read more, click are foxes dangerous? do more fox live in urban or rural settings? Foxes have long been a prevalent animal closely associated with humans and can be found on nearly every continent in the world. On the North American continent, foxes have long existed in folklore, children’s literature and are generally thought to be cunning and trickster animals. Some species of foxes have even been partially domesticated and probably will be kept as pets one day in the future once their natural aggressiveness can be tamed. Foxes come from the same family as wolves, dogs, and jackals but are different in that they are smaller. The fox can be recognized for its distinctive face that includes small features with large ears and very large eyes. Many people would characterize them as “cute” and therefore do not like killing them. Foxes have a pelt that is a mixture of colors (with the exception of the arctic fox which is all white and the red fox which is a brilliant auburn color) that include a goldish color, white, red and black highlights. Foxes are also recognized by their huge bushy tails that are used to communicate amongst themselves. Foxes are opportunistic hunters and foragers. They live in small family units in subterranean dens and will hunt and forage together. 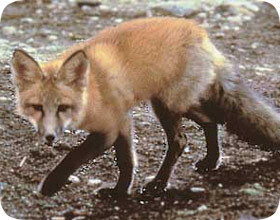 Foxes are omnivores and will hunt small rodents such as mice and reptiles such as snakes and frogs. Foxes will also forage for berries, eatable plants and dead insects. Foxes will store their food near their dens by burying their food under piles of leaves or at the base of bushes. A major staple of a fox’s diet is rabbits and it was found that both the populations of rabbits are foxes are entirely dependent on one another. Foxes will mate in the winter and will have anywhere between two to twelve pups per litter. Both the male and the female will stay to raise the pups for almost an entire year before the pups become sexually mature and go off on their own to start their own family. The average life expectancy for a fox in the wild is only two to four years due to frequent deaths involving cars, intentional killing by humans and diseases. Foxes do carry the rabies virus and can infect your pet if it bites your dog or cat. Foxes have grown very accustomed to urban areas and will scavenge unguarded trash and the occasional small dog, bird or cat. Humans have provided foxes with a new food source and new possibilities for shelter. It is not uncommon to find a family of foxes living underneath your porch or in the shed that you never use. While most people do not mind living near foxes, many other people do not like the inconvenience of having them around. Some people will even begin to feed the foxes, but you should not do this as it only encourages more foxes to move in and human food is very bad for their digestive systems. Not to mention that foxes carry many diseases such as rabies and parasites that they can pass to your pets through contact or their droppings, and then your pet can pass that to you. Please refrain feeding foxes if they live near you. Foxes have an amazing ability to adapt to any environment and temperature which makes them one of the most successful species of wild canine species in North America. As of now, foxes are in no danger of going extinct because of American’s amicability towards them. They continue to capture our imaginations and our hearts with their looks and the low impact they have on our lives. What are some ways to kill a fox in the yard? Where do foxes live? Do more foxes live in urban areas, or wild areas? Are foxes dangerous to humans? What diseases do foxes carry and what are some symptoms of a sick fox? Is a fox that is active during the daytime sick or rabid? Is a fox a danger to pets or farm animals?